Fall crafts are a great way to let kids exercise their creativity while improving fine motor skills. A whole bunch of materials and substances to touch, feel, glue, cut, and play with will engage the senses. Embrace the colors and crisp air of autumn with these easy fall crafting ideas for kids! 1. Press leaves– Go on a quest for the prettiest autumn leaves you can find. Let your kids collect a rainbow of leaves, and then bring them inside. Press them between wax paper with a warm iron, and use them to decorate! This is an activity that children should do with an adult so everyone stays safe. This activity engages both the visual and tactile senses. 2. Take kids on a photography walk– Take a walk around town or a try out a scenic trail while the leaves are in fullburst. 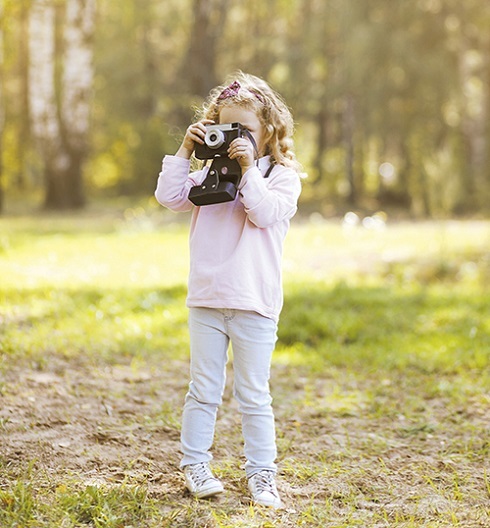 Let your kids have full control of the camera and tell them they’re photographers for the day. Photography is a creative activity that teaches kids to use technology to create art. Remind them to consider point of view and perspective while taking photos. Then you can print the photos out and use them as decoration or wall art or make photo albums. 3. Learn to knit– Teaching kids to knit or crochet can be a really fun activity for a rainy day. Kids will be really excited by the prospect of hand-making gifts for others or new winter accessories. Knitting and crocheting is a great way to improve fine motor skills and hand-eye coordination. If knitting is too complex you can use the yarn to make friendship bracelets. 4. Make a birdfeeder– Take a trip down memory lane to your own childhood and make a pinecone birdfeeder with your kids. This fun fall art project only takes some pine cones, peanut butter, and birdseed. This activity has kids working with different substances and textures in a constructive way. It engages the tactile sense. 5. Spice Wheel– Teach your kids about different spices. Fall is a season for nutmeg, cumin, cinnamon, cloves, ginger, and any other spices you have in your house like paprika and turmeric as well. Put the spices out in separate bowls and describe each one to your child. Let them smell each spice and tell them what countries each spice originates from, how they’re used in cooking and baking, and why they’re good for you. Want more information on children’s activities? 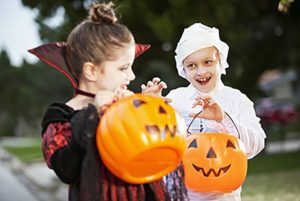 Check out these tips to help make Halloween easier for a child with a sensory issue.